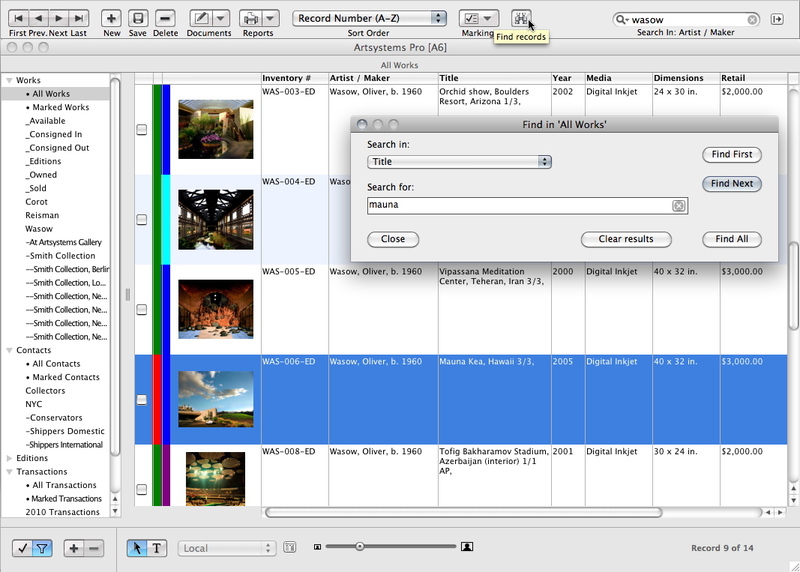 The Search tool locates records displaying searched-for information within any field. All matching records will display together in the spreadsheet view. The Find tool locates the first, next, or all matching records. Both tools are very powerful when used together.Pro's fully relational structure makes related records across all five modules — Works, Editions, References, Contacts, and Transactions — only a click away. Types, Alternate Types, Media, Categories (Tags), and Location Details are user defined and editable, making search criteria easy to understand and user friendly. 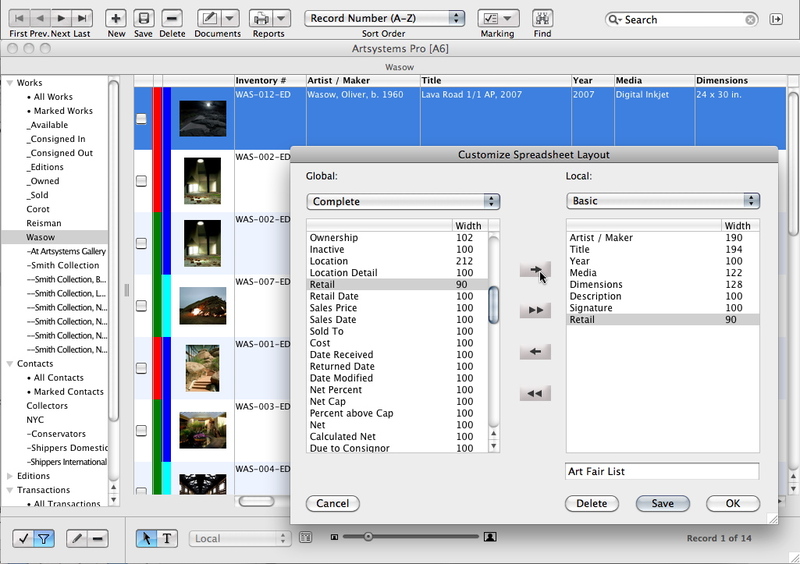 User-friendly prompts help users create 'View Sets' of matching records easily. Dozens of pre-configured common shortcuts are available for making queries in each module at a click, and advanced queries allow drilling-down unlimited multiple criteria. Queries with commonly used criteria can be saved and named for one-click future access, for example, 'available works by a certain artist'. Advanced queries, created in seconds, can answer questions such as 'how many works are available at this price at this location' or 'who purchased this artist's work who lives outside of this city' or 'which of my shippers handle international shipments'. Worksheets are static groups of records created by manually marking records or via a View Set query — works chosen for an art fair, for example. 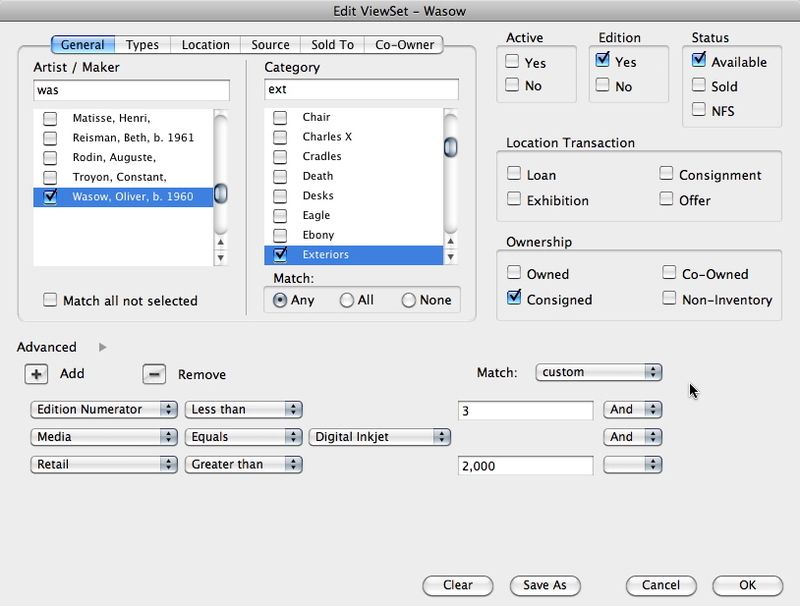 Creating one-click access to Worksheets and frequently used View Set queries in Artsystems Pro is automatic when saved; each named set with saved parameters is listed in a menu under its module name in the program pane at left — one view for Worksheets, and one for View Sets — and can be ordered to suit. 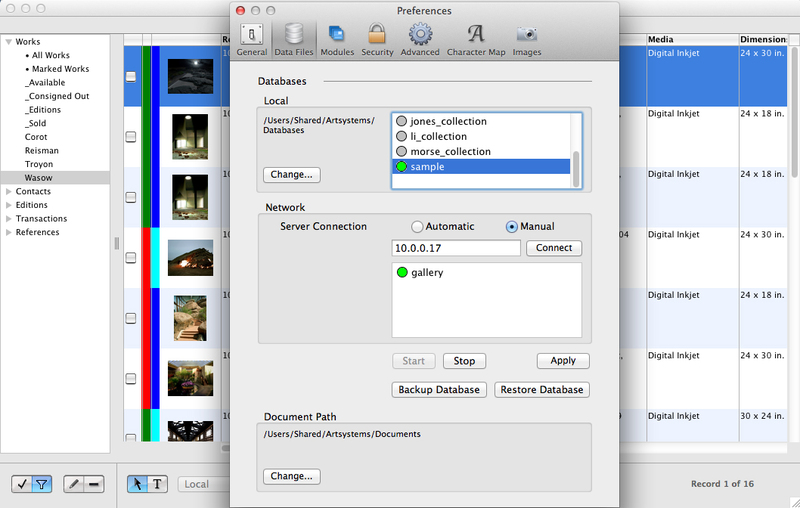 Saved View Set queries are dynamic; opening one gives realtime results, as the data displayed is always current. 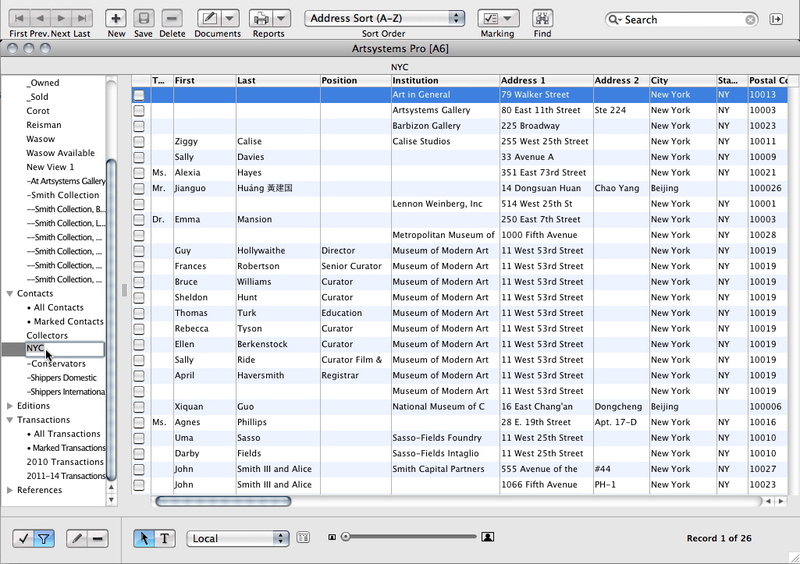 At left is an example of a saved View Set: contacts whose addresses are in New York City. Nearly every field in each module — Contacts, Works, Editions, References, and Transactions — displays in its spreadsheet view. And the non-linked fields can be edited directly in the spreadsheet. Create and save multiple spreadsheet layouts: choose specific fields to be displayed, change the order of the columns, adjust image size, row height and column width for optimum report display and printing — and name for future repeated use. A powerful tool when used with saved queries, saved layouts allow users to call up custom table views of critical information with only two clicks. View our tutorial video for a walk through. Choose from dozens of default sort orders, or sort spreadsheets by clicking on the header for any column. Spreadsheet Reports can include totals and can be printed with images, in Word, quickly and efficiently. In Pro, users can switch between multiple databases on the fly in order to manage clients' individual collections or separate inventories, etc. New users can switch to the built-in sample database to try out advanced features without being concerned with affecting live data.